Ramaraja Ramasamy has been named associate dean for academic affairs and assessment for the College of Engineering at the University of Georgia. Ramasamy, a member of the UGA faculty since 2010, will work with the faculty and the chairs of the College of Engineering’s three schools to evolve and enhance the student experience. He will be responsible for critical college-level academic processes including curriculum changes, administering the high-demand major application process, promotion and tenure, and third-year review. He will lead the implementation and maintenance of assessment processes associated with accreditation efforts in the college. Ramasamy began his new role Aug. 1. Ramasamy first came to UGA as an assistant professor in biochemical engineering in 2010. He was named an associate professor in 2015. During the 2016-2017 academic year, he served as founding chair of the new School of Chemical, Materials and Biomedical Engineering. Ramasamy also serves as an adjunct professor in UGA’s chemistry department. Ramasamy has developed and taught bio-electrochemical engineering courses at the undergraduate and graduate level. His research in the areas of electrochemical energy conversion, biosensors and bio-nanomaterials overlaps with material science, biochemistry, microbiology, biotechnology and analytical chemistry. His work has resulted in 60 articles in leading scientific journals. 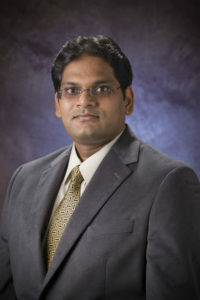 In 2001, Ramasamy earned a bachelor of technology in chemical and electrochemical engineering from Central Electrochemical Research Institute in India. He received a Ph.D. in chemical engineering from the University of South Carolina in 2004. Ramasamy succeeds Ramana Pidaparti, who has served in this role since 2014. Pidaparti will return to full-time research and teaching in the College of Engineering.